DESCRIPTION: Set within the popular quarter of St.Johns is where you will find this well proportioned 1 bedroom second floor apartment situated within a purpose built development. There is a choice of lift or stairs leading to the apartment which itself consists of an entrance hall with entry phone, spacious open plan living and kitchen area with the kitchen including a fitted cooker and hob. There is a good sized double bedroom and bathroom with white suite. The property's windows are double glazed, there is an electric heating system and a single allocated parking space set within the central courtyard at the rear. This property is being offered in conjunction with Moat Housing on a 50% shared basis allowing a more affordable option to enter the property market. The property is offered with the benefit of no forward chain and interested applicants are encouraged to view without delay. SITUATION: The property enjoys an extremely convenient location off Culverden Park Road and St Johns Road, just north of Royal Tunbridge Wells town centre. The area remains extremely popular with Tunbridge Wells town centre being less than a mile away offering a comprehensive range of shopping facilities at the Royal Victoria Place shopping mall and Calverley Road pedestrianised precinct. Tunbridge Well has a main line station offering a fast and frequent service to both London and the South Coast. Beyond this the St Johns shops and restaurants are equally close with two metro supermarkets, a host of independent retailers and excellent eating and drinking facilities. In general the area is well served with good schooling both state and independent for children of all ages. Recreational facilities in the area include golf, cricket, lawn tennis and rugby clubs, a number of parks, local theatres, the Tunbridge Wells sports and indoor tennis centre and the out of town Knights Park leisure centre with its tenpin bowling complex, multi screen cinema and private health club. Tunbridge Wells is rightly renowned for the Pantiles, the Common, its architecture, a health mix of independent retailers, restaurants and parks, many of these are readily accessible from this property. ENTRANCE HALL: Entry phone, wood effect vinyl flooring, electric wall heater, power points, cupboard housing the electric boiler for hot water, fusebox and storage shelf above. LIVING ROOM/KITCHEN: A spacious open plan room with wood effect vinyl flooring, two electric wall heaters, power points, tv point. Two rear windows with fitted blinds, satellite tv point. Kitchen Area: Fitted with a range of wall and base units with work surfaces overs, stainless steel single drainer sink unit with mixer taps, space for washing machine, electric oven and hob with fitted filter hood above. Tiling adjacent to the work surfaces, space for fridge/freezer. 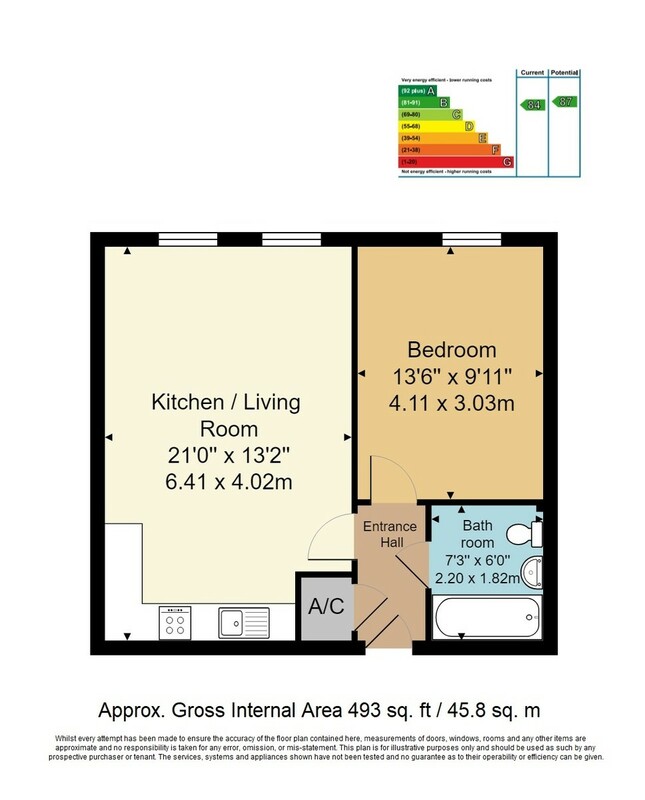 BEDROOM: A double room with electric wall heater, power points, tv point, telephone point. Rear window with fitted blind. BATHROOM: White suite comprising of a low level wc, pedestal wash hand basin with mixer taps, panelled bath with mixer taps and wall shower fitment, tiled shower area and surround. Vinyl flooring, extractor fan, electric towel rail, shavers point. OUTSIDE: A single allocated parking space is situated within the courtyard parking area to the rear of the property. AGENT NOTE: This property is offered to purchase on a 50% shared equity with Moat Housing, rent would be payable on the remaining 50% at £364.05 per calendar month from the 1st April 2019. We understand from the vendors that this payment also includes the service charge. Interested applicants will need to satisfy Moat Housing's criteria for suitability before any sale can be agreed in full.